Did you know when radio took 38 years and TV took 13 years internet took only 4 years to reach 50 million users. Those who have access to it almost use internet every day. Almost 300 million people use internet every day but very few of them will be aware with a myriad of facts about internet. Check out these amazing facts about the incredible internet. 1. 1/7 th of the world’s population are Facebookers. 2. 57% of internet users chat more online than they do in real life. 3. 1 in 8 coupes who married in the US last year met via social media. 4. 1 in 5 divorces are blamed on facebook. 5. There are over 770 billion facebook page views per month and more than 30 billion pieces of content shared on it each day. 6. The average Facebook user is 4.7 degrees away from anyone else on Facebook including the queen, the president of the USA Johnny Depp and H.H The Dalai Lama. 7. 48% of under 35s check their Facebook first thing in the morning; 28% before they even get out of bed. 8. The fastest growing segment on Facebook is 55-65 year old females. 9. The UK is the world’s 22nd most populous country but it is the world’s fourth largest facebook user. 10. More people read Justin Bieber’s twitter than the global readers of the times, the new york times, the sun, the wall street journal, the daily telegraph, the washington pos, daily mail, usa today, the guardian, daily mirror, the independent, daily express, los angeles times combined. 11. Lady Gaga has more twitter followers than the global Jewish population. 13. Two-third of people research products and businesses online before engaging with them offline. 14. 31 million people from the UK regularly shop online. 97% of British females use search engines to research products and services online. 92% of them regularly buy products online. 15. 91% of millionaires use search engines to research luxury products online before deciding on a purchase. 16. Only 12.5% of people are influenced by ads or advertorials in a newspaper or magazine. 17. Only 18% of TV advertisements generate a positive ROI. 18. 90% of people who can fast forward through TV advertisements do. 19. There are now more mobile phones on the planet than there are human beings. 20. 15% of people use their mobiles to shop online. 21. Most use Google to find what they want to buy. 22. The global web economy has been doubling in size every two years. 23. One of the biggest Deterrents to a purchaser engaging with a brand online or offline is poor website design. 24. Only 14% of people trust advertisements but 83% of people trust the information on Google’s result pages. 25. Google sees 2.9 billion searches everyday. This is the largest and most targeted marketing platform in history. 26. Every second there are 5000 facebook status updates,2000 twitter tweets,34,000google searches. 27. Worldwide Web was developed in Objective C programming language. 28. Any web policy or standard do not require the “www” part of a website and it is optional. 29. All three letter word combinations from aaa.com to zzz.com are already registered as domain names. 30. People often use the term internet and World Wide Web without much distinction in every-day speech however they are two different terms. 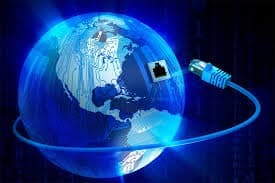 The Internet is a global data communications system. It is a hardware and software infrastructure that provides connectivity between computers. On the contrary, the Web is one of the services communicated by means of the Internet. It is a collection of interconnected documents and other resources, linked by hyperlinks and URLs. 31. It is considered by the researchers that the first search engine was Archie, which was created in 1990 by Alan Emtage, who was a student at McGill University in Montreal, Canada. 32. Did you know that the original URL of Yahoo! was http://akebono.stanford.edu. 33. Google got its name from the mathematical figure googol, which denotes the number ‘one followed by a hundred zeros’. 34. The main reason the Google home page is so bare, is because of the fact that the founders didn’t know the HTML and just wanted a quick interface. Actually, the submit button was added later on and in the beginning, hitting the RETURN key was the only way to burst Google into life. 35. Anthony Greco was the first person to be arrested for spam at the age of 18, on February 21, 2005.He was sending unsolicited instant messages. 36. It was 22 years back when the first website of the world was launched on 6th of august 1991 by a team of CERN engineers led by Sir Tim Berners-Lee. CERN is the French acronym for European Council for Nuclear Research and is located at Geneva, Switzerland.